It is used to intercept all data communications in an area from New Zealand to the Middle East. It controls the satellites which are used to provide targetting information for the drones used against civilians in places like Pakistan, Yemen, Iraq & Afghanistan. 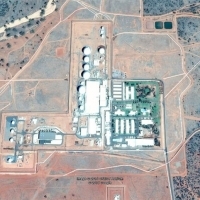 From 26 September we'll be at the gates of Pine Gap actively blockading the ongoing use of Australian facilities being used to kill people on the other side of the world. Please help us get there and shut down the US war machine! On the road to Pine Gap to protest the US war machine in central Australia. We need funds to help us: pay for fuel & supplies to make this year's action at the gates the most awesome one yet.